What Is An ASET Image? The quality of diamonds used in fine jewelry is extremely high. This makes diamonds with great fire and brilliance both rare and expensive. When buying diamonds, customers need to have the most information possible. While a knowledge of the four c’s is very important, there are other tools used to help determine the quality and value of a diamond. One such tool is the ASET image. ASET is an acronym of Angular Spectrum Evaluation Tool. It was designed by the American Gemological Society, or AGS, to show the way a diamond handles light. The purpose of ASET is to provide quantifiable results on diamond light performance. Using this tool, a jeweler or gemologist can explain how the light performance and the diamond’s proportions affect the value of a diamond. These images help customers make a more informed decision when buying diamonds. What is in an ASET image? ASET images consist of three colors: red, blue, and green. 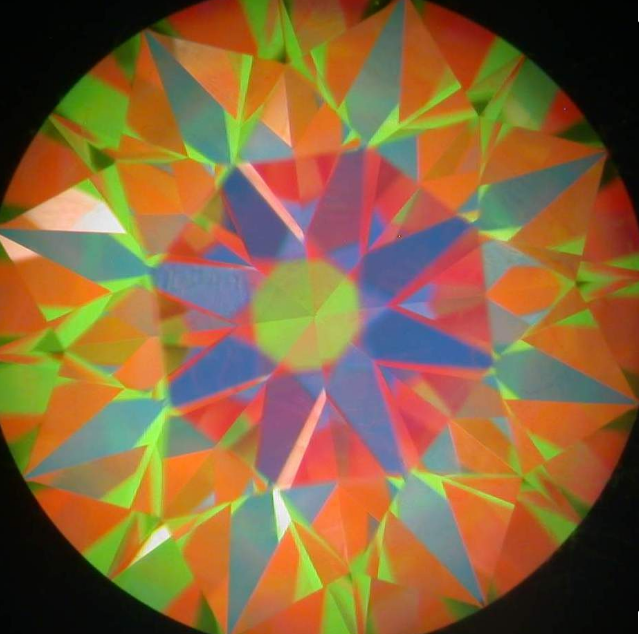 These colors are representative of light passing through a diamond. Light refracts as it passes through the diamond. Different wave lengths of light appear as different colors. The red color demonstrates the highest amount of light from above. Therefore, red is a good indicator of a diamond’s brilliance. On the other hand, green indicates returned light from less direct sources and reflected back at other angles. Finally, blue shows contrast, or light that enters the diamond but is blocked from returning. Different diamond shapes will present different ASET images, so it is important to understand how to read ASET images. While the AGS created ASET as an evaluation tool, it is not the sole indicator of a diamond’s quality. Additionally, while many diamonds have ASET images, this is not always the case. For instance, recently cut diamonds will often not have one available. If you would like more help in understand a diamond’s ASET image, contact our customer service team today!